#25 and #25H chain is the most common type of chain used on electric scooters, electric bicycles, electric pocket bikes, electric dirt bikes, and small electric go karts. #25 and #25H chain has a 1/4" center to center spacing between each link pin, an 1/8" spacing between inner plates, and is approximately 1/4" wide. 8mm chain is also called T8F chain and is the most common type of chain used on higher powered pocket bikes and electric scooters. 8mm chain has an 8mm (5/16") center to center spacing between each link pin, a 4.7mm (3/16") spacing between inner plates, and is approximately 10mm (3/8") wide. #35 chain is the most common type of chain used on mopeds, mini bikes, and full size go karts. #35 chain has a 3/8" center to center spacing between each link pin, a 3/16" spacing between inner plates, and is approximately 3/8" wide. 1/2" x 3/32" chain is used on multiple speed bicycles with derailleurs and cluster sprockets. 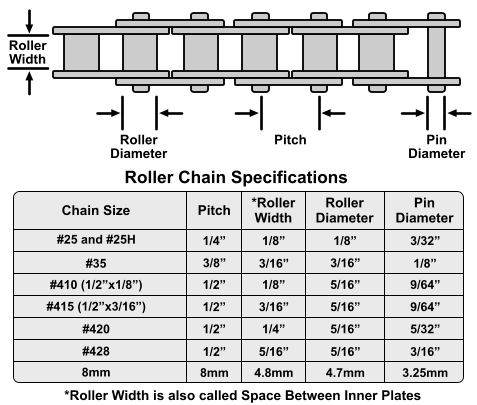 1/2" x 3/32" chain has a 1/2" center to center spacing between each link pin, a 3/32" spacing between inner plates, and is approximately 3/8" wide. #410 chain is used on single speed bicycles, internal gears bicycles such as three speeds, and for electric bicycle motors. #410 chain has a 1/2" center to center spacing between each link pin, a 5/16" spacing between inner plates, and is approximately 3/8" wide. #410 chain is also known as 1/2"x1/8" chain. #415 and #415H chain is used on motorized bicycles, freight bicycles, and heavy-duty tricycles. #415 and #415H chain has a 1/2" center to center spacing between each link pin, a 3/16" spacing between inner plates, and is approximately 3/8" wide. #415 and #415H chain is also known as 1/2"x3/16" chain. #420 chain is the exact same size as #41 chain however it has thicker pins which makes it stronger. #420 chain is used on motorcycles, mini bikes, go karts, and motorized tricycles. #420 chain has a 1/2" center to center spacing between each link pin, a 1/4" spacing between inner plates, and is approximately 1/2" wide. #428 chain is used on motorcycles, mini bikes, go karts, and motorized tricycles. #428 chain has a 1/2" center to center spacing between each link pin, a 5/16" spacing between inner plates, and is approximately 5/8" wide. #25 is standard-duty #25 chain and #25H is heavy-duty #25 chain. specifications listed above. #25 standard-duty chain and #25 heavy-duty chain both fit the same size sprockets. #410 is 1/2” x 1/8” chain for single speed bicycles. We stock roller chain, master links, offset links, double offset links, chain lube, and chain tools for virtually every make and model of electric scooter, electric bike, and electric go kart ever made. We carry #25 chain, #35 chain, #410 bicycle chain, #415 chain, #420 chain, #428 chain, and 8mm T8F metric chain.